Volker on Mobile Entertainment: No ad-supported content after all? Really? No ad-supported content after all? Really? We will all remember that ad-supported content was the flavour of the month a short while ago. There were successful trials and a lot of hype all around, hell, there are even MVNO based on this model. Now, however, there is a survey that suggests that people will pay to avoid ads (if you are a true believer, look at the end of this post though...). Who's right then? While the vast majority (56%) believes that content downloads to mobile phones should be free of charge, there is a growing number of consumers that are so averse to advertising that they are now willing to pay a premium in order to avoid it, signifying a shift in how operators need to be tailoring their offering. A substantial 25% of respondents said that they would rather pay for a download if it guarantees them immunity from advertising. Now, what then? Free content? And who is paying us poor sods who produce it? Hmm. Now, it gets even more confusing: according to the study, in particular the younger demographic shuns ads. 35% of the 16-24 year-olds would rather pay than get ads vs. only 17% of the (presumably battle-hardened and more cynical) 35-44 year-olds; one would have thought so that the elders with their higher spending power were more likely to pay... Hmm, hmm. 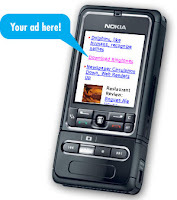 One symptom of this trend is the increased resistance to targeted advertising on mobile phones. Whilst 47% of people feel that adverts tailored to their individual tastes and interests are a good idea overall, half of those who were willing to receive targeted ads on the internet were not happy to receive them on their mobiles. This would suggest that there is a trend (or rather demand) to bridge the boundaries between media: offer content and do, by all means, use advertising to finance it but do stream the latter to other user screens (presumably the PC first and foremost). Are there any models out there to address that? I haven't heard of any and I must say that I find implementation of this rather tricky to achieve. Just another study then? Hmm, hmm, hmm. NOW, just when I clicked "publish", I received one of my favourite newsletters, the very recommendable VentureBeat, who published an interview with Nielsen's SVP Mobile Media, Jesse Goranson, and, what can I say, he says it's all good: according to yet another study he cites (which I cannot access), 53% of advertisers (ah, not consumers then) anticipate a rise in mobile ad-spend in the next year. Goranson does, however, also state a flux and indeed uncertainty about where it is going to go revenue-wise. More hmmm's then, I guess. Good night!